3 size options: Small, Medium or Large. Fall Foliage is called “kouyou” in Japanese and the kanji (Chinese characters) means red leaves. Kouyou is inspired by my favorite season, Fall. 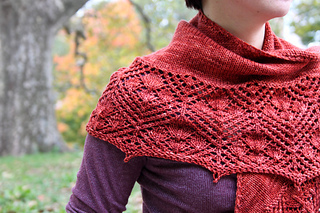 The leaves turn brilliant shades of reds, oranges and yellows and the brisk air makes it perfect weather for a cozy shawl. 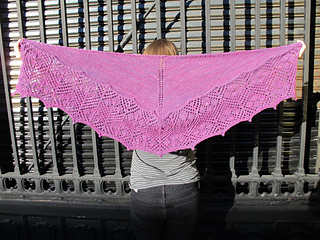 Knit from the center back to the bottom edge, Kouyou can be quickly knit up in either worsted or sport weight yarn to ward off the impending chilly weather. This 7 page pattern has both written and charted instructions. 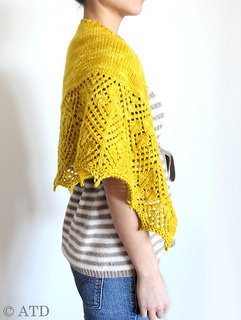 The shawl starts off with a simple stockinette section, then the lace portion and it ends with a bind off with picots. 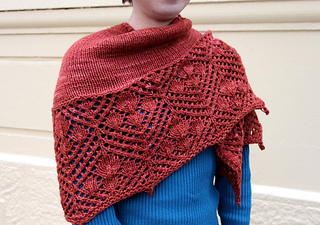 It also includes directions and pictures on how to block the shawl. 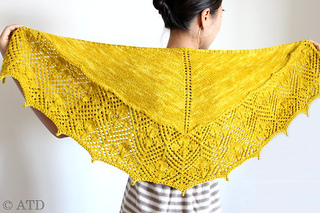 Yarn Requirements: There are 3 size options for the shawl: A (small), B (medium) and C (large). A: 420 yds/ 384 m of worsted weight, B: 450 yds/ 411 m of sport weight and C: 550 yds/ 503m of worsted weight. 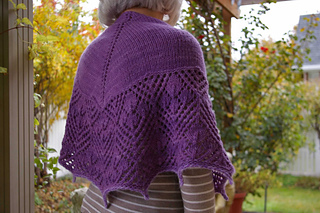 Gauge: Gauge is not crucial, but it will affect the finished size and the amount of yarn needed to complete the project. -Worsted weight: 4 sts and 7 rows = 1” in stockinette (after blocking). -Sport weight: 4.5 sts and 7 rows = 1” in stockinette (after blocking). 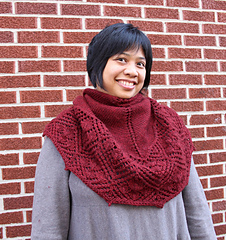 Thank you to Rebecca, Penelope, Sarah, Tomo, Lisa, Emily, Larisa, Rebekah and Kelly for helping me test knit this pattern.